Distinguished Research Professor of Economics at the University of Minnesota (Morris Campus), USA. He was a visiting scholar in 2002-2003 and then in 2008-2009 at the Center for Social Theory and Comparative History, Institute of Social Science Research, UCLA. The 1990-1995 was fellow and associate at Center for the Middle Eastern Studies, Harvard University. He is pioneering theorist of globalization of oil and the unification of energy sector, globalization of world economy and decline of the Pax Americana. Specialist on modern Iran and the contemporary in the Middle East. Fellow of Economists for Peace and Security and editor for the Journal of Critical Studies in Business and Society. He is also an author of Classical Political Economy and A Century of Petroleum – on YouTube. 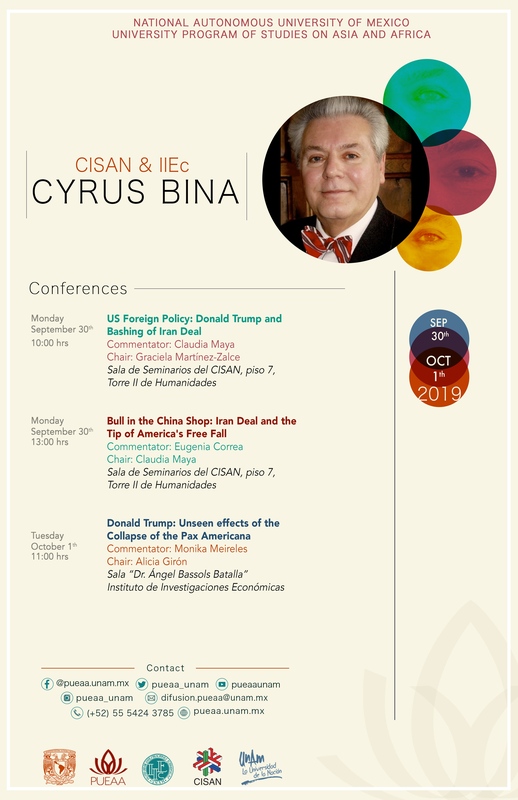 Bina, C. The Rise of Globalization and the Decline of American Power: The Political Economy of the American Fall. Oxfordshire, UK: Routledge (forthcoming). Bina, C., Moudud, J., Mason, P. (2013). Alternative Theories of Competition: Challenges to the Orthodoxy. London: Routledge. Bina, C. (2012). Oil: A Time Machine—Journey Beyond Fanciful Economics and Frightful Politics. Ronkonkoma, New York: Linus Publications. Bina, C., Clements, L., Davis, C. (1996). Beyond Survival: Wage Labor in the Late Twentieth Century. Armonk, New York: Routledge. Bina, C., Zangeneh, H. (1992). Modern Capitalism and Islamic Ideology in Iran. London/New York: Macmillan/St. Martin’s Press. Bina, C. (2014). Global Oil and the Fallacy of Middle Eastern Oil Dependency. In Steger, M.; Battersby, P., Siracusa, J. The SAGE Handbook of Globalization, Los Angeles, CA: Sage Publishers. Bina, C. (2013). A Prelude to the Foundation of Political Economy: Oil, War, and Global Polity, New York: Palgrave Macmillan. Bina, C. (2013). Synthetic Competition, Global Oil, and the Cult of Monopoly. In J. Moudud, Bina, C. and Mason P. (eds. ), AlternativeTheories of Competition: Challenges to the Orthodoxy, London: Routledge. Bina, C. (2012). Oil: A Time Machine—Journey Beyond Fanciful Economics and Frightful Politics, Ronkonkoma, New York: Linus Publications, 2nd(Revised) Edition.